✱ Most Likely to Space Out: Paul Allen and aerospace engineer Burt Rutan of Scaled Composites made history in 2004 with SpaceShipOne (scaled.com)—the first privately constructed manned spacecraft to successfully enter suborbital space. ✱ Class Brain: Founded in 2003, the Allen Institute for Brain Science (alleninstitute.org) is responsible for endeavors like the Allen Brain Atlas project, completed in 2006, and the first-ever summit for brain sciences. ✱ Best Science Fair Project: Funded and managed by Allen’s Vulcan Inc., Project Halo (projecthalo.com) is a research effort to develop a problem-solving artificial intelligence, currently dubbed “Digital Aristotle,” with the goal of creating an artificial tutor and/or scientific assistant with the ability to consider and answer novel questions. 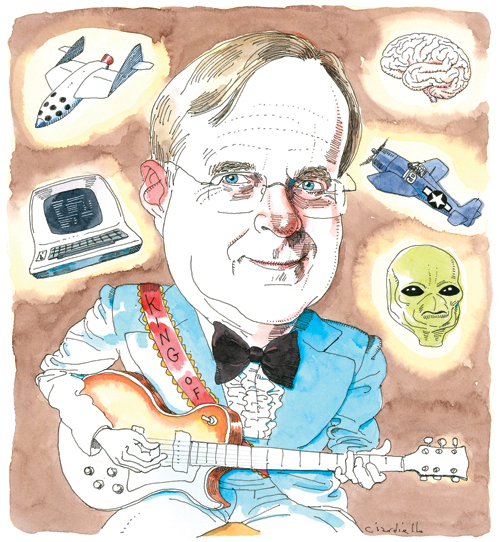 ✱ Most Dedicated Hobbyist: In 2000 and 2004, Paul Allen opened the Experience Music Project and the Science Fiction Museum (empsfm.org), permanently conjoining two of his hobbies inside one very colorful, very misshapen building. ✱ Best Computer Tutor: What started in 2006 as a digital documentation of ages-old computers has evolved into an impressive timeline of computer technology called the Living Computer Museum, which boasts a working VAX-11 (livingcomputermuseum.org; not yet open to the public). ✱ Biggest Model Airplane Collection: In 1998, Allen began acquiring World War II–era aircraft, which he renovated and put on display in 2004 as the Flying Heritage Collection (flyingheritage.com) at Paine Field in Everett. ✱ First Place at Battle of the Bands: What kind of multitalented software developer and noted philanthropist would Allen be without a short-lived musical career on his résumé? From 1996 to 1999, Allen played guitar and wrote lyrics for Grown Men (grownmen.com), a rock group that performed original material. Sadly, the band’s single self-titled album cannot be found on iTunes or Amazon—perhaps there’s a copy in storage at the EMP? Favorite makeout song: "(Our Love's in) Jeopardy"
Catchphrase: "'Bodies of Water' for $200, Alex." Best pickup line: "Wanna create a new convergence zone?" Catchphrase: "Do you believe this weather?" Motto: "Just put your lips together and blow."